This plaque is on the wall of Merton College in Deadman’s Walk (on the north side of Christ Church), and was put up in October 1984. 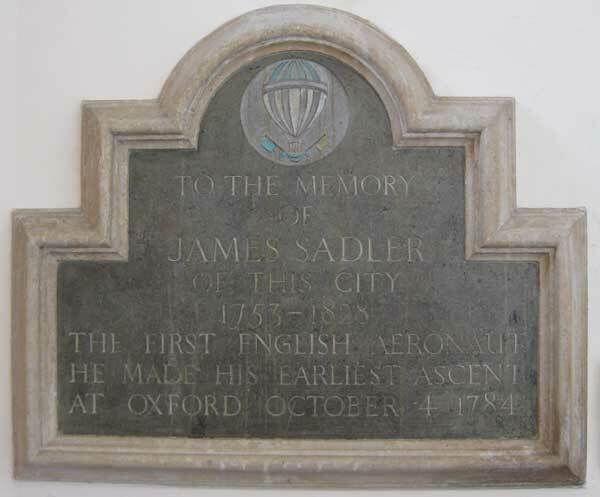 James Sadler was the son of James Sadler senior, an Oxford pastry cook, and his wife Elizabeth. He was baptised at St Peter-in-the-East Church on 27 February 1753, as was his younger brother Thomas in July 1756. 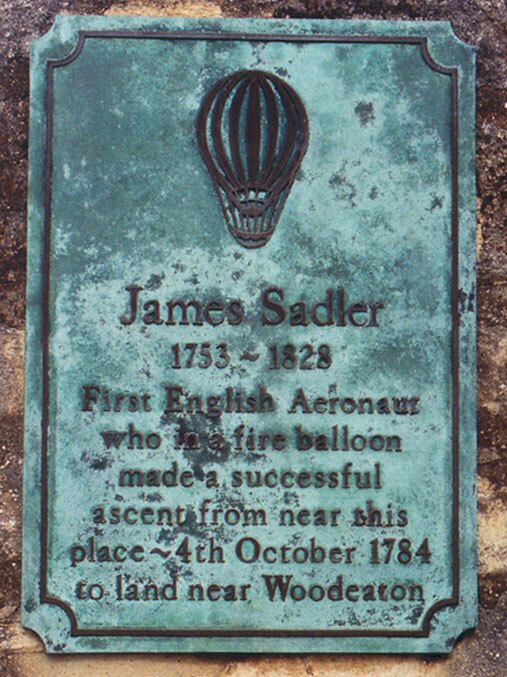 James Sadler began experimenting with small gas-filled balloons while working as a laboratory technician in the University’s chemistry laboratory. On 4 October 1784 he “ascended into the atmosphere” from Christ Church Meadow, and the hot-air balloon (which was estimated to have risen to a height of 3600 feet) came down six miles away near Wood Eaton. 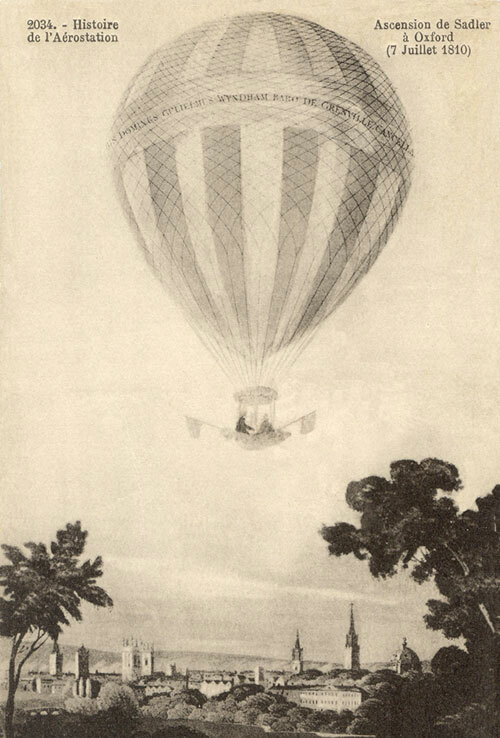 The next month, on 12 November 1784, Sadler’s second flight (this time from the Botanic Garden, and in a hydrogen balloon) reached Aylesbury after about twenty minutes. In this year  and in several following years, an ingenious native of Oxford, Mr. Sadler (afterwards known as “the Aëronaut”), gave lectures on what he called “philosophic fire-works”…. Mr. Sadler was a clever, practical, and experimental manipulator in chemistry, and as such was patronised by the University, or rather by the few scientific men then in the University; what the University, as such, did or even professed to do in scientific matters at that period it were hard to say. 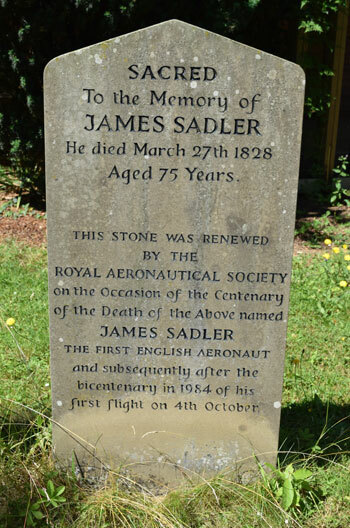 Two of Sadler’s sons predeceased him: Captain James Sadler died in India in 1818, and Windham Sadler died in a ballooning accident in 1824. James Sadler himself died at George Lane (now George Street) at the age of 75 in 1828 (on 26 March according to his obituary, or 27 March according to his gravestone). He was buried in St Peter-in-the-East churchyard on 30 March. 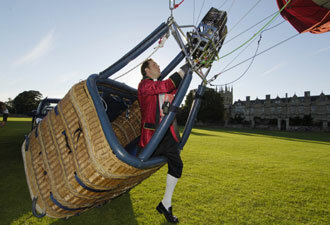 On Wednesday last died in this city, in the 73d year of his age, Mr. James Sadler, the celebrated aeronaut. Mr. Sadler was the first person in that hazardous profession who might be said to be his own architect, engineer, chemist and projector. His first ascent was from this city, on the 4th October in the year 1784, in a fire-balloon, raised by means of rarified air, when after remaining in the atmospheric regions for half an hour, he descended in safety between Islip and Woodeaton, six miles from hence. To enumerate the many hair-breadth escapes Mr. S. has met with in his various excursions would far exceed our limits; but it is allowed by all that the most splendid ascent ever witnessed was the one from this university in the year 1810, on the Installation of Lord Grenville. On that occasion Mr. Sadler and his son ascended in a magnificent balloon from Merton Fields, and after remaining in sight for two hours and a half came down in perfect safety in a field at North Crawley, Bucks.